Context: I’ve been enrolled in a course this January looking at the Theology and Practice of Ministry. Part of the coursework involves Service Learning, basically working with a local non-profit and reflecting on the experience like any of the other text books. 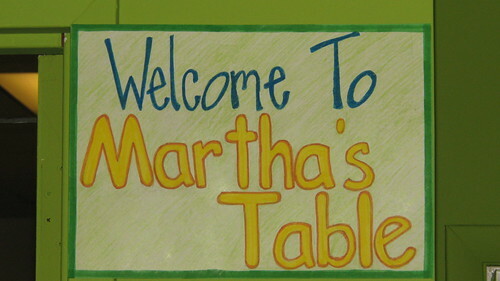 I’ve been assigned to the group at Martha’s Table, a major non-profit in DC focusing on education and poverty. Our particular ministry, McKenna’s Wagon, involves vans that head out into DC 365 days a year to serve dinner to the homeless. Awareness of our own context, listening to our own lenses and the realities that shape our worldview helps us to understand the diverse perspectives from which humans interact. What would be considered effective and important ministry at UCSD would be useless to the men on the corner of New York Avenue. How much do we miss of one anothers communication because we are listening with ears attuned to another worldview? At the same time, if action is to be called “ministry” it must be directional. It must point toward the Kingdom of God. While we begin with different tools and start from different places, we are all learning to walk in the same direction. The great unifier across great socio-cultural divides is the hope of Christ. That hope harmonizes with all of the different possible rhythms of human life. Still, we must be aware whether we are dancing the Mambo or Tango. We must not be tone-deaf to the needs of those around us. Expecting my model of service or ministry to function in any context is arrogance. If we are to serve others, we best ask what they need and truly listen. The dynamic attention of living in the particularity of human life with a bend toward the ultimate reality of God has been lived in its completeness in the incarnation. Jesus was both incredibly contextual and completely subversive. Learning to both and, to live out of our human particularness and celebrate that particularness in others while doing our best to bend the world in the direction of God’s Reign is the art of Christian ministry, it belongs to each and every follower. End of an Era, birth of Hope?